Special Vote applications opened on 4 April and close on 18 April. 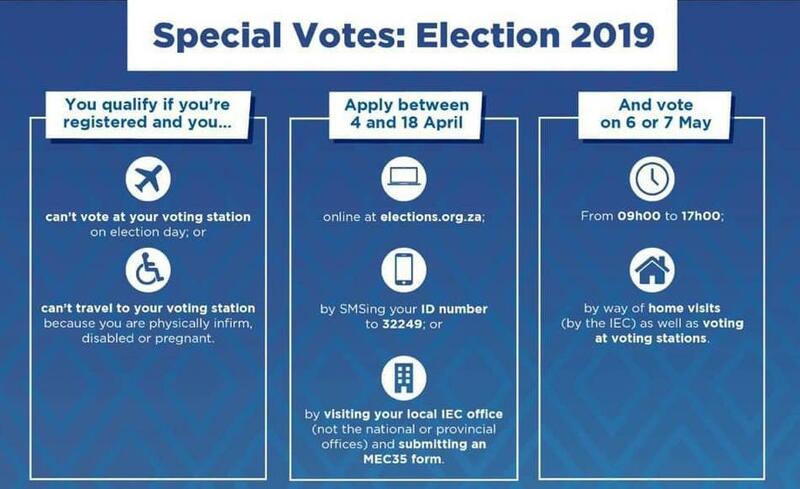 So, if you or a member of your family will be unable to visit your polling station on Wednesday 8 May 2019., you may be allowed to cast a special vote. In order to do so, you will need TO APPLY for a special vote – either on the prescribed form (not recommended), via SMS (not for home visits), or online (preferred). For people who are unable to get to a voting station. Your carers may also apply. You must to be correctly registered for the voting station serving your home visit address. The IEC will not allow you to vote in your home if you are incorrectly registered. Home visits are normally done in the morning. Someone from the Voting Station will call on the day to arrange a time. This is for voters who will be away on Wednesday 8 May (voting day), and those who want to avoid election day queues. You must vote at the Voting Station where you are registered. The Voting Station will be open from 9am to 5pm on Tuesday, 7 May. Please bring your ID document. Only those who have applied will be allowed to vote. • To apply via SMS between 4 – 18 April (not for home visits) – send your identity number to 32249. Note: The deadline to register to vote overseas has passed.